Great demand at Gortin Mart for fat lambs on Tuesday which sold to £118/26kg. Store lambs sold to £90. 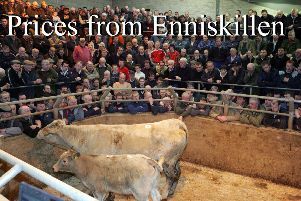 Michael O’Hara £118/26kg, C Moran £117/28kg, Reid Clarke £107.50/26kg, C McCrudden £106.50/25kg, S Miller £105.20/27kg, Reid Clarke £105/25kg, Robert Lowry £104/26kg, Martin Doherty £103.50/30kg, Matthew Blair £102/25kg, Craig Hamilton £102/25kg, J Donnell £102/26kg, H McCollum £101.80/26kg, A McMurray £100.50/26kg, D Walker £97.20/23kg, John Logue £97/23kg, Alan McCrea £97/24kg, Matthew Blair £92/26kg and Tynan Roulston £82/22kg. Craig Hamilton £90/20kg, Terence McCracken £83, Norman McFarland £81.50/18kg, Tynan Roulston £80, £77, T McGilligan £78, Craig Hamilton £74 and Richard Fulton £64. Chris Gourley £84, J O’Kane £8050, Ryan Morrison £80, Chris Gourley £73 and Craig Hamilton £70.